The bottom line is that despite the public gamesmanship and talk of possible terms, under oath or not, the President almost certainly can’t and won’t take the risk. So the question that will have to be resolved in the days to come is whether Mueller will subpoena– try to force– the President to testify in front of a grand jury. Independent Counsel Ken Starr prepared to subpoena President Clinton before he ultimately agreed to answer questions, under oath. I have been publicly predicting that Mueller would not take the subpoena plunge. Not because the President would succeed in any legal challenge. The Supreme Court in the Nixon case ruled: “Neither the doctrine of separation of powers, nor the need for confidentiality of high-level communications, without more, can sustain an absolute, unqualified presidential privilege of immunity from judicial process under all circumstances.” Yes, there are differences here from both the Paula Jones/Clinton case (civil v. criminal) and the Nixon ruling (subpoena of tapes v. testimony) but in the end, Mueller’s legal odds would be more than good. Even though few expect Mueller to seek to indict a sitting president, that doesn’t mean that they aren’t investigating him the same way they would anyone else. And typically a prosecutor would not subpoena a target because, in essence the defendant would be called in front of a grand jury just to invoke his/her fifth amendment right against self-incrimination. The goal of a subpoena is not to just create a constitutional show, but to get testimony and evidence which you won’t get from a target. But what has me questioning my previous assessment, is that Giuliani now seems to be working off a timeline. While on the one hand publicly admitting that delaying the process works to the president’s advantage, he rushed to submit his response to Mueller yesterday. So has Mueller threatened to subpoena the president? Almost certainly. Will he actually do it? I am still betting no but with far less confidence than I initially had. I asked my followers on twitter who are lawyers and legal geeks to weigh in on the question and they were similarly divided. Here is a sampling of the responses on both sides. Yes! Case against son and Jared. Always saying this is the player move and he can only assert 5th to stop it!!! Absolutely. His mandate is to investigate Russian interference w/2016 presidential election. How could he do a through and sifting investigation if he doesn’t interview all of the central players at least once? Yes. Mueller will not be able to overlook the multitude of crimes he committed but it will be the illegitimacy of his presidency that will give Mueller the steam to indict him. With each new TV appearance and other public comment, Giuliani sure seems to be making a subpoena from Mueller more and more likely. He will do all he can to get our president no matter what it takes. It is a damn shame because the Justice system is destroyed and corruption has become the new normal. Trump’s mistake… he should have fired Comey Jan 21, 2017 for his bumbling idiocy regarding Clinton! No. He doesn't need #ReverseMidasTrump's testimony and the prolonged struggle that would likely attend enforcing the subpoena isn't worth the additional public sturm und drang created by 45 & his second rate team. I remain in the "no subpoena" camp. Gives DT team something else to fight about for way too long, and as said in previous comments its not necessary. Geek, not lawyer, but I think a subpoena and the resistance to it will take longer than the rest of the term. Mueller won’t ask him anything he doesn’t already have the answer to anyhow. I'm not so sure he will. Trump is incriminating himself as it is. I think if he does it will be at the end of it. I just hope we have justice. A sitting president should never get to be above the law and kept from being indicted just because of the office. Doesn’t need his testimony. DT is a target. Mueller won’t force him to testify. 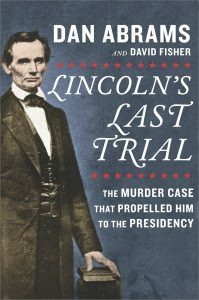 On this week’s New York Time’s Bestseller List, Dan’s new book Lincoln’s Last Trial: The Murder Case That Propelled Him to the Presidency was listed as number nine in the bestselling non-fiction books, just below John McCain’s memoir and edging out James Comey’s book A Higher Loyalty for a spot in the top ten. Donald Trump recently claimed that having Judge Gonzalo Curiel, a Hispanic judge, preside over one of the lawsuits against Trump University, is somehow biased against Trump. Trump went on to say that even a Muslim judge might be unfit to hear a case against him as well, a comment denounced by the vast majority of Republican leaders for being bigoted and undermining the judicial system. Dan recently wrote an article for Mediaite.com on this issue NOT requiring media balance or an objective light, he commented, “In certain cases, the two sides are much simpler: right and wrong. In those relatively rare cases, it should be the media’s obligation and duty to shed the veneer of “objectivity” and specifically and vociferously call it what it is. Wrong. Donald Trump‘s claim that Judge Gonzalo Curiel, presiding over one of the lawsuits against Trump University, is somehow biased against him because he is “Mexican”(born in Indiana of course) is one of those cases.” Read the full article here. 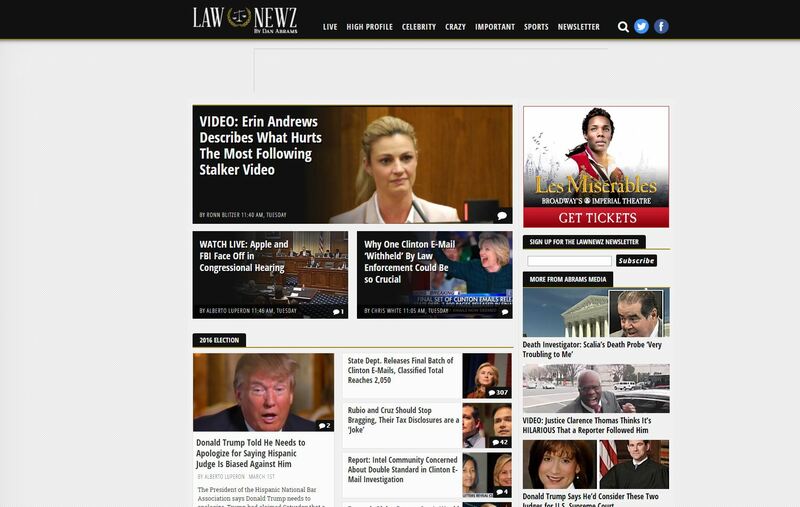 Dan wrote an article for LawNewz.com about the ongoing Hillary Clinton email scandal. Media reports are stating the FBI has not found criminal wrongdoing in the investigation of her email server, thus far. Dan writes, “As I have explained before, criminal wrongdoing can and should not be equated with doing wrong. Based on what we know now, I believe Clinton is only guilty of the latter but who knows what the investigation uncovers.” Dan continues to analyze the ongoing situation in his piece; read the full article here. 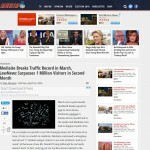 Big congratulations to Mediaite.com and LawNewz.com! 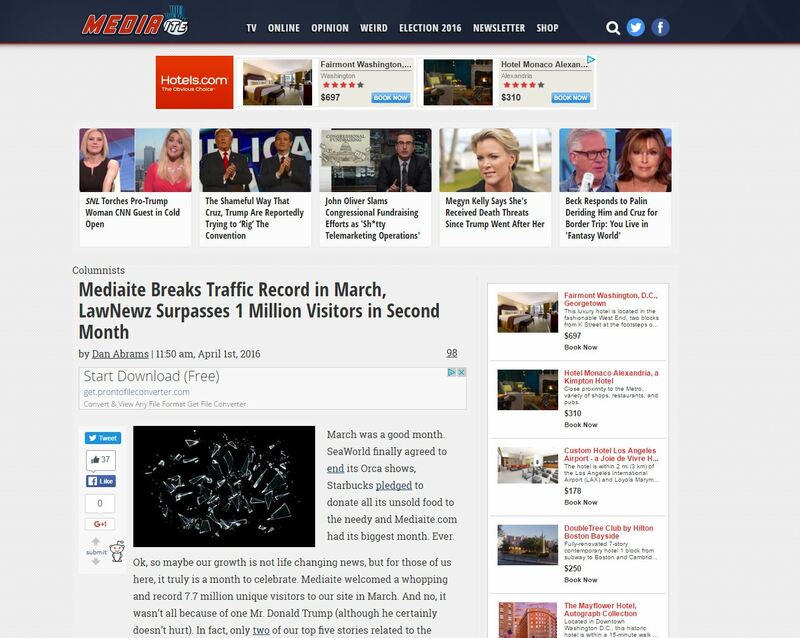 Both sites had a banner month this March with Mediaite breaking a traffic record and LawNewz surpassing 1 million visitors (in only its second month!) 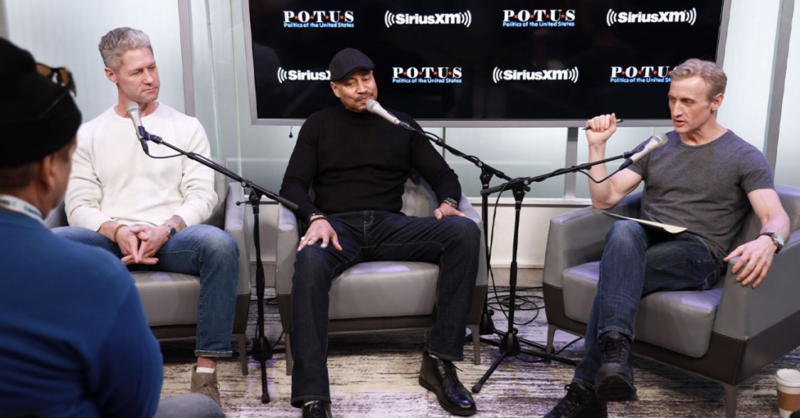 Mediaite welcomed a whopping and record 7.7 million unique visitors and the site gave a shout out to Managing Editor Jon Nicosia as well as the whole Mediaite team. Check out more details here. 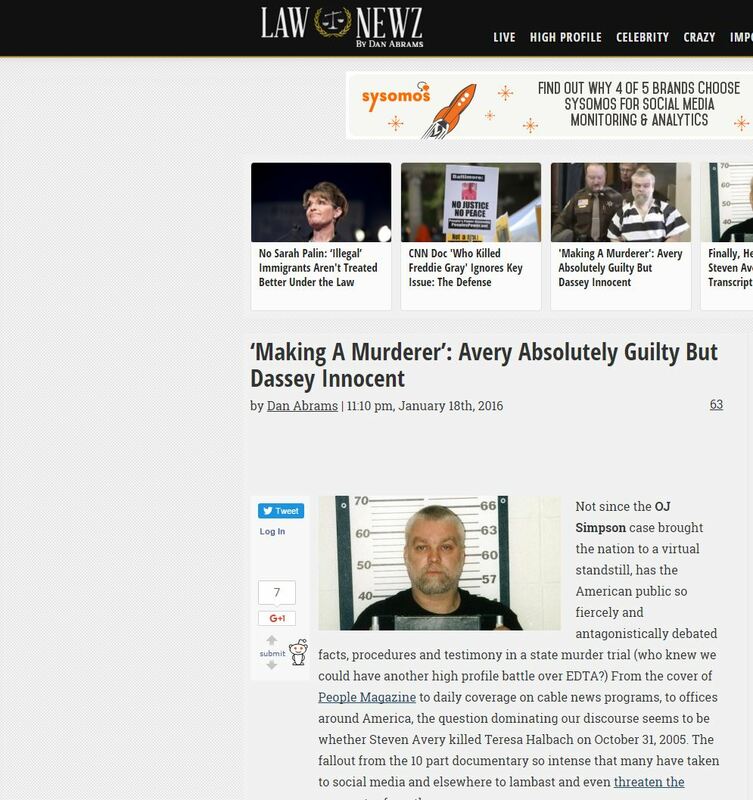 Dan has kicked off LawNewz with a bang commenting on the Steven Avery case as well as the Brendan Dassey case from the hit Netflix documentary series, “Making A Murderer”. The true crime docu-series has struck a nerve with the public and has taken social media by storm, so Dan evaluated the evidence to weigh in on the guilt or innocence of Avery and Dassey. He writes, “Not since the OJ Simpson case brought the nation to a virtual standstill, has the American public so fiercely and antagonistically debated facts, procedures and testimony in a state murder trial”. 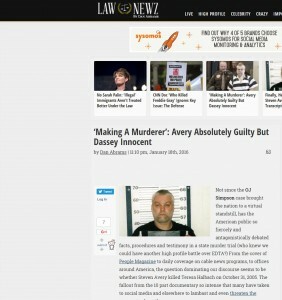 Dan goes on to analyze the facts and evidence of the case and concludes (as the title of the article suggests) “Avery Absolutely Guilty But Dassey Innocent”. Read the full piece here.